Solve your work-related pain and rejuvenate your love of doing dentistry! Internationally recognized as a dental ergonomics expert, Dr. Valachi created Posturedontics, a website where you’ll find powerful evidence-based, unbiased dental ergonomic education and products to prevent pain and extend your career. How can I resolve my neck, shoulder and back pain? What are the best ergonomic loupes & stools? How can I improve my posture and patient positioning? What's the best exercise for dental professionals? Prevent Pain, Boost Productivity and Extend Your Career with Evidence-based Ergonomics! Are you tired of working with pain? Prevent pain & improve your posture with evidence-based ergonomics. Are you seeking a dynamic dental lecturer? Dr. Valachi has delivered over 700 lectures worldwide. Her engaging lectures captivate audiences with humor, participation and demonstrations. Is pain affecting your quality of life? Visit our store, and start to resolve your work-related pain today! Our #1 bestseller, the Wellness System bundles 4 video kits at a great price! A 'Get Unstuck' Virtual Session with Dr. Valachi in the comfort of your operatory! Discover evidence-based dental ergonomic interventions and easy home therapies to prevent neck pain. Exercises developed specifically to correct the painful muscle imbalances to which dental professionals are prone. 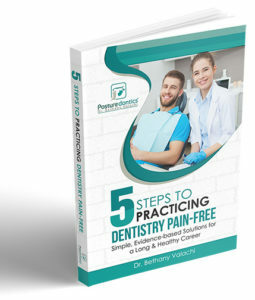 "Practice Dentistry Pain-Free: Evidence-based Strategies to Prevent Pain & Extend Your Career"
Learn 20 chairside stretches and self-treat your painful trigger points using the Backnobber trigger point tool. Discover how proper utilization of neck cushions can improve patient tolerance to positioning that improves YOUR posture! Stream dental ergonomic education LIVE to your entire team: positioning for team members, equipment selection & adjustment. Are you ready to revitalize your health & practice? | Shop now! To effectively resolve neck pain in dentistry, your ergonomic education must be evidence-based and unbiased. Dr. Valachi's doctorate studies focused on neck pain in dentistry and offers a wealth of information in her Neck Pain CE Course. Are your loupes CAUSING PAIN? Learn how to select loupes that will improve your health, not make it worse in Dr. Valachi's video course, "Ergonomic Guidelines for Selecting Dental Loupes". Dr. Valachi offers two types of Virtual Coaching: Try the 'Get Unstuck' 20 minute mini-session or the more comprehensive Virtual Consultation. Discover which loupes, stools, chairs, lights, instruments and more meet Dr. Valachi's ergonomic criteria to help improve comfort and extend careers! This was one of the most relevant and well received lectures in our 7 years as a study club. Bethany took a potentially dry topic and made it entertaining, educational, and practical. Thank you for sharing your knowledge with us! Great course content, excellent instructor. It’s about time! This information has been badly needed in dentistry. Finally someone has pulled it all together. All testimonials | Click here!